This is what any recording of this piece has to be about - communicating a masterpiece afresh without veering from tradition - and this recording now joins a select few at the top of the list. 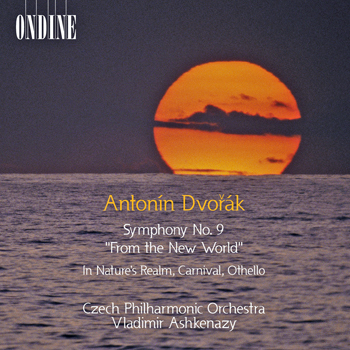 Though there are many fine versions of the New World Symphony, this one stands comparisons with the finest, as well as offering a unique and apt coupling in its two-disc format. This double CD (for the price of one) features Vladimir Ashkenazy conducting the Czech Philharmonic Orchestra, who perform their compatriot Antonín Dvořák's famous Symphony No. 9 "From the New World". Also included are the three overtures Opp. 91-93, In Nature's Realm, Carnival and Othello. Vladimir Ashkenazy served as the Czech Philharmonic's chief conductor from 1998-2003. These recordings were made in 1999 at the orchestra's home residency, the Dvořák Hall in Prague's historic Rudolfinum.